Mix the sugar, cinnamon, and sesame seeds in a medium-size bowl. Pop open the tube of dough and pull apart the biscuits—they come preportioned, so this will be easy. In a big, heavy pot, heat the shortening over high heat; you’ll know it’s ready when a tiny piece of biscuit dough sizzles when added to the oil. 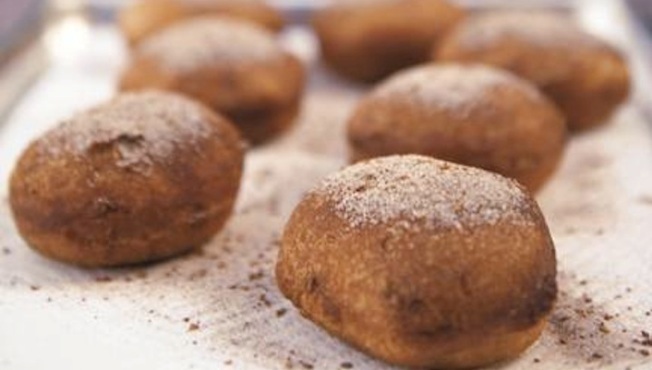 Fry the biscuit dough until each piece becomes puffy and brown on all sides, about 2 minutes. Flip the pieces over and fry them for 2 minutes more. Pull out the doughnuts and rest them on paper towels for a minute or two, then toss them immediately in the sugar mixture. Reprinted with permission from L.A. Son: My Life, My City, My Food by Roy Choi. Copyright © 2013 by Roy Choi, Tien Nguyen, and Natasha Phan; photographs © 2013 by Bobby Fisher. Published by Anthony Bourdain Book/Ecco, an imprint of HarperCollinsPublishers.